Fall is the ideal time to plant perennial flowers, trees and shrubs and our plant sale is the ideal place to buy them! We will have a variety of flowering perennials, uncommon evergreens, dwarf and full size trees and much more. Need planting and landscaping advice? Garden staff and Master Gardeners will be on hand to help customers with plant suggestions and general gardening advice. See comment section for photos of our inventory list. The public sale will be held from 9am - 2pm on Saturday, September 29th at the UT Gardens in Knoxville. 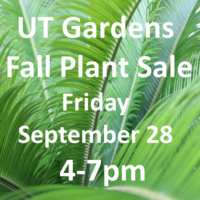 Garden members and UT Faculty and Staff can shop the preview sale on Friday, September 28 from 4 - 7pm. Memberships may be purchased or renewed during the preview sale or the public sale. In addition to having an early shopping opportunity, garden members receive 10% off their plant sale purchases during the preview or the public sale.